We are delighted to welcome literary critic and academic Dr Stefano Jossa to present the eighth in a series of annual lectures on subjects of Italian interest made possible by a generous bequest from alumna, and former lecturer in French and Italian, Professor Lucrezia Zaina. In the third book of New Essays Concerning Human Understanding (1765), the German philosopher Gottfried Wilhelm von Leibniz used the Italian expression l’invenzione la più vaga to prompt the idea of “the liveliest and richest imagination”. Less than three quarters of a century later the English philosopher John Stuart Mill wrote to his correspondent Gustave d’Eichthal that it was not easy for an Englishman to learn the dolce far niente of the Italians. Both Leibniz and Mills wrote in French, but they could not find anything better than Italian to suggest what they wanted to express. 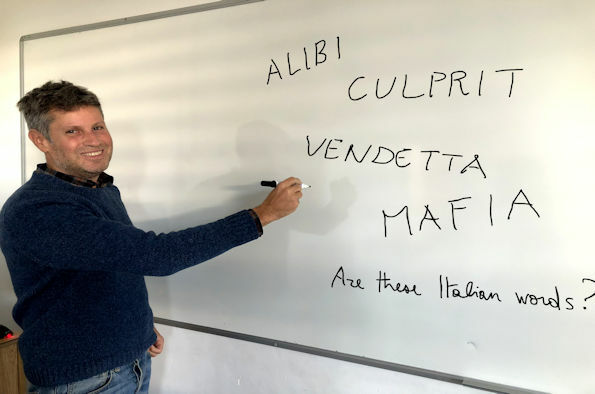 In this lecture, literary critic and academic Stefano Jossa will explore the presence of the Italian language in foreign use, in order to investigate what, if anything, Italian can still express better than any other language. Dr Stefano Jossa is the author of La più bella del mondo. Perché amare la lingua italiana (Einaudi 2018). He is Reader in Italian Studies at Royal Holloway, University of London, and held visiting professorships at the Polytechnic (ETH) of Zurich (De Sanctis Chair), the Università degli Studi di Parma and the Università degli Studi Roma Tre. He is a regular contributor from London to the Italian daily il manifesto and the online journal doppiozero. His major monographs include: L'Italia letteraria (il Mulino 2006); Ariosto (il Mulino 2009); and Un paese senza eroi. L'Italia da Jacopo Ortis a Montalbano (Laterza 2013). His editorial work includes: Giancarlo Mazzacurati, L'albero dell'Eden. Dante tra mito e storia (Salerno Editrice 2007); Citation, Intertextuality and Memory in the Middle Ages and Renaissance: Volume 1: Text, Music and Image from Machaut to Ariosto (Liverpool University Press 2011); Chivalry, Academy, and Cultural Dialogues: The Italian Contribution to European Modernity (Legenda 2016); and special issues of Italique (2012 and 2013) and Renaissance and Reformation/ Renaissance et Réforme (2017). Italian has been taught at this university since 1881 and today Italian Studies is housed within the Department of Modern Languages and Cultures (MLC). We are a small and friendly community of academic and teaching staff whose research and teaching interests cover contemporary fiction, linguistics, film and cultural studies. The lecture is funded by a generous legacy bequest from Lucrezia Zaina, known as Lexie, who was a lecturer in French and Italian at the University from 1964 until 1988. Legacy gifts are a significant source of donations to the University and benefit the institution long into the future, funding ground-breaking research, scholarships and bursaries and improving facilities for students. Since 2012 a reduced rate of Inheritance Tax is applicable to estates that leave at least 10% to charity, increasing the benefits of legacy gifts further. We endeavour to make our events accessible to all. If you have specific requirements that you would like to discuss, we will be pleased to hear from you and will do our best to accommodate your needs. Disabled Go! The event is FREE but places are limited. To reserve yours, complete the booking form (up to two tickets per person).